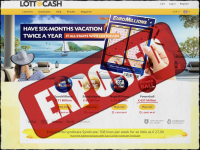 Is Lotto.Cash a Scam or Legit? Read Reviews! Deposit: Visa, MasterCard, Skrill, Neteller, Klarna, etc. I guess it might be keeping with the kiss rule but there are only four international lotteries to play online at Lotto.Cash plus three syndicates. Players do have the option to play one or more tickets, plus play multiple weeks and/or subscribe. Lotto.Cash offers players access to play four international lotteries – US Powerball and Mega Millions, EuroMillions and EuroJackpot. People can choose to play one ticket or more for 1, 2, 4, 8 and 52 weeks – or choose to subscribe. There aren’t any discounts for multi-play or subscriptions. There are three different syndicate options – Euro Combi, US Combi or VIP World. Buy in on all their syndicates is a minimum of one month. At first glance, the advertised tickets look pretty good – NOT. Break it all down and the actual numbers aren’t great. Add to that, there is nowhere that says how many shares are in each of the syndicates. That’s one my personal bottom lines. I love syndicates but I want to know how many people I’ll be sharing any winnings with. Lotto.Cash pays out the mirrored image of the lotteries – mostly as they buy the tickets, collect and then pay out to you. “Reasonable” commission might be applicable on currency exchanges. Otherwise, it appears there are no other fees or charges on winnings though there isn’t a lot of information available in the terms and conditions. There is also no information on how quickly you get your winnings. There are also some references to winnings when betting on international lotteries – though didn’t find a link on their page to do this. As Lotto Cash says your first bet is on them. If you don’t win – whatever you’ve spent is put back into your account. You can’t withdraw it but can use it for more lottery tickets. This is only for straight play – not for syndicates. Funny, Lotto.Cash services are not available to people in the UK. It seems anyone else can play. There is also the minimum requirement of being 18 years or older depending on the rules and regulations of where you are playing from. Though they advertise the site available in fifteen languages, click on the terms and conditions and it’s only English. This online lottery provider is registered in Curaçao (with a head office address) with credit card payments handled out of Malta. Hang on – then it says under the “Contact” page that they are a registered trademark with a snail mail address in England. There is also an email address plus online form. Not sure when they actually answer emails. We’ve been waiting for several days. Lotto Cash also is hooked into Facebook, Twitter, and Instagram. There is a weekly competition for players on Facebook. Would you mind rating Lotto.Cash? With only four international lotteries online – okay they are the big ones – playing is fairly limited. Their syndicates have no information on the number of shares each has. The terms and conditions are very limited with little information on when you will get your winnings. This site gets a thumb’s down – especially if you live in the UK. The other thing is communications. We’re still waiting for answers to our questions.